You are looking for a useful gift for yourself or your family or friends and it will be a good choice. 1x gift box, 1x Universal Socket, 1x 3/8" power drill adapter, 1x grade universal ratchet wrench. This socket drill adapter fit most screw in fasteners; hexagonal and square nuts and bolts, hooks, wing nuts, and more, even damaged and rusted fasteners，In addition to round bolts. You will be pleased to have purchased our Universal Socket Wrench because it is an ultra-high-quality utility that is manufactured using high-end S2 tool steel to create the perfect shopping experience and ease of use , You will need him to make your life easier! This socket drill adapter features a compact design, easy to store in your home or car, 100% portable to assist you wherever needed. Offer this handy universal socket tool to any DIY enthusiast friend and they will definitely appreciate it. Weierken is committed to providing the customer with the best source for value possible on the market. You will enjoy the quality, function, and usefulness our Universal Socket Wrench Set has to offer. If for any reason you are not satisfied, please give us an opportunity to improve your experience by contact us through "Your Orders" tab in your Amazon account. Click "add to cart" and get your own now! 【S2 Tool Steel Construction】 : This universal socket is crafted with S2 tool steel and has 54 chromoly steel concave heavy-duty pins, Excellent impact tool steel, excellent strength and toughness, high-end tool steel , provide you with a reliable and durable tool for efficient applications. 【Ultra-Effecvive】: Fits standard 1/4 to 3/4-inch and metric 7-19mm nuts and bolt heads,Self-adjusts to fit thousands of fasteners, make it easy to remove and replace irregular fasteners. 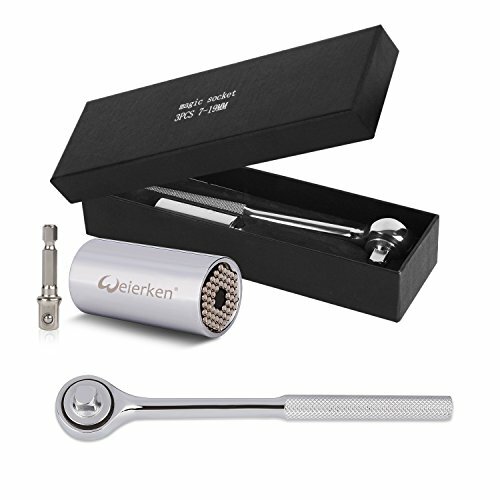 【Versatile Application】: The Weierken Gator Socket adapter grip wrench Suitable for a variety of routine maintenance tasks,Regardless is eyebolt, wingnut, square-nut, hooks, even rusted or damaged bolt heads nothing can resist our tool. 【Toolbox Essentials】: This lightweight Gator socket drill adapter kit not only can be combined into a hand operated wrench, and fit power drill ,easy storage and portability, you will need him to make your life easier. 【Excellent Gift Idea】: This universal socket Wrench set include：1x gift box, 1x Universal Socket,1x 3/8" power drill adapter,1xgrade universal ratchet wrench,ready to be gifted to any friend or family member. A helpful and practical present that will impress any DIY enthusiast,Handymen, Builders, Craftsmen.